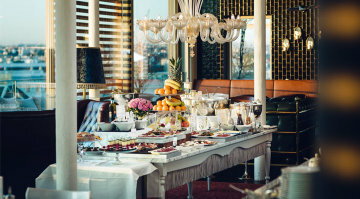 Enjoy the brunch high above Vienna on our rooftop. Treat yourself to whatever your heart desires to an extended Grand Étage breakfast buffet. Choose between cold and hot classics of the Austrian and international cuisine and decide on a variety of egg dishes. Various desserts will satisfy everyone with a sweet tooth. We will also offer juices, coffee, tea and hot chocolate and alcoholfree drinks. Binding reservations will be confirmed in writing.